You're about to write the best civil engineering resume around. It's got a drafting table monitor, a Herman Miller chair, and a 9-foot poster of Alan Voorhees. In that office, you solve fun, massive puzzles that help millions. 300 other applicants applied for the job. You got it. How? Your civil engineer resume made you look like Elon Musk with an ASCE pin. Civil engineers are trusted with life and limb. Your engineering resume must prove your worth without a single microcrack. A civil engineering resume example better than 9 out of 10 other resumes. How to write a civil engineer resume that lands more interviews. Tips and examples of how to put skills and achievements on a civil site engineer resume. How to describe your experience on a resume for a civil engineer to get any job you want. 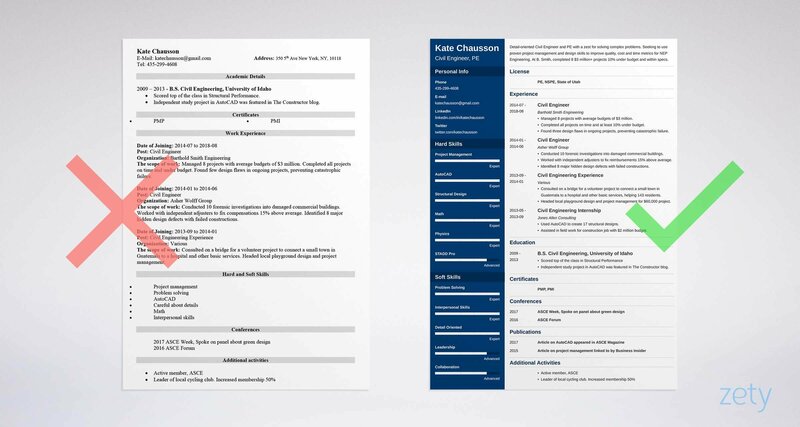 Here's a civil engineering resume template made with our online resume builder tool. What's the Best Civil Engineering Resume Format? What's the difference between a beautiful engineering project and disaster? Is it any wonder you need to show that in a civil engineering resume? Start with the best resume format as a good foundation. The chronological layout is the best civil engineer resume format. Why? It breaks ground with your most recent experience. 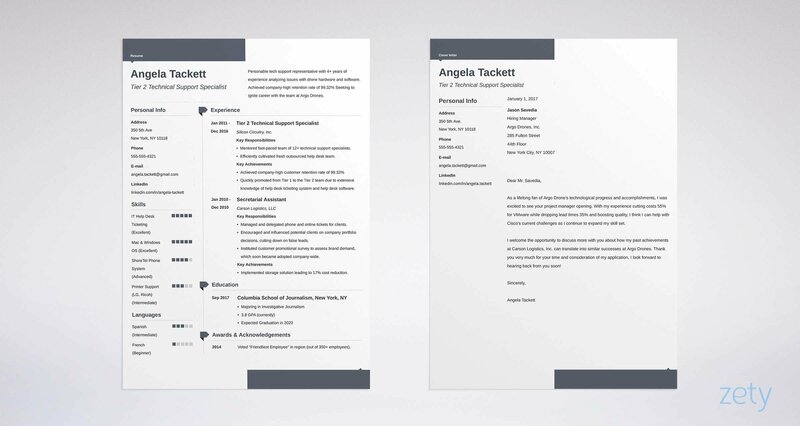 Design it right with the best resume fonts, clear headings, and a backdrop of white space. Finally, should you send an MS Word Doc Resume or PDF resume? In the days before prestressed concrete, PDF resumes weren't up to code. Today's PDFs are machine readable. Civil engineer resume PDFs are your best bet unless the job offer forbids them. Do you doubt your ability to turn out perfect written copy? Find a lawyer in your social network, then have her proofread your civil site engineer resume. Lawyers make great proofreaders because they live by the written word. Pro Tip: How long should a resume be for civil engineering? If you've got more than 5 years of experience, consider a two page resume. Otherwise, go with one. Imagine you've got 30 seconds with the hiring manager for your dream job. Do you tell her every detail of your last position? Start reading out a lengthy skills list? Or do you say, "I oversaw 20 project employees and routinely handled multi-million dollar projects?" That's the essence of a civil engineering resume objective or summary. A resume summary is for applicants with skyscrapers of experience. It teases your solid work history. A resume objective shows passion when you lack experience. Use it if you haven't even built a birdhouse yet. The real trick? Construct either with measurable achievements. Does this experienced civil engineer resume example work? Engaged civil engineer, looking for new position with a great company and plenty of room for advancement. Highly skilled and motivated in the areas of project management, with top-notch CAD skills and good grasp of structural design. That's under-reinforced. Stacked up against 300 other civil resumes, it's yawn-inducing. Detail-oriented Civil Engineer and PE with 5 years of experience and a zest for solving complex problems. Seeking to use proven project management and design skills to improve quality, cost and time metrics for NEP Engineering. At Barthold Smith, completed 8 $3 million+ projects 10% under budget and within specs. "But I don't have that kind of civil engineer experience." That won't stop you. See the entry-level civil engineering resume examples below. Still a junior civil engineer? Junior civil engineering applicant, seeking entry-level job. I'm fresh out of college, so I haven't handled any real-world projects yet, but I'm very smart and capable. You can almost see the stress cracks. 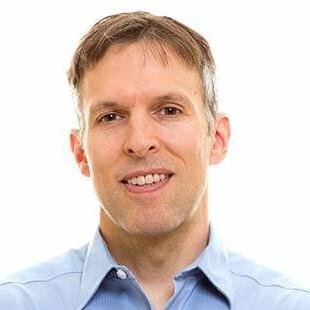 What hiring manager will trust you with important work? Detail-oriented Civil Engineer with solid math and physics background. Seeking to provide design and project management excellence for Asher Wolff Group. Completed internship with Jones Allen Consulting, regularly using AutoCAD and working on multi-million dollar projects. Also consulted on a bridge that helped 140+ Guatemalan residents safely access basic services. Zap. That's a great career objective for civil engineers for freshers. The hiring manager is interested. The best part? You didn't need 10 years of experience. You already had the summer internship. You did the other project online in a few days. Pro Tip: Indeed.com, engineerjobs.com, ziprecruiter, and careerbuilder all get great reviews from civil engineers. Post your EIT or civil engineer resume on each to get noticed by recruiters fast. Picture a hiring manager. Her name's Molly. She's got a coffee mug that says, "What's so civil about engineering?" and a stack of resumes 300 deep. How can your civil engineer resume stand out like a cable-stayed bridge? By picking only the bullet points Molly cares about. To do that, read the job ad carefully. Highlight the duties and responsibilities you see. Then, make sure every bullet point proves you can deliver them. Which of these experienced civil engineer resume samples does it right? Managed 8 projects with average budgets of $3 million. Completed all jobs on time and at least 10% under budget. Found three design flaws in ongoing projects, preventing catastrophic failure. Used AutoCAD and creative materials sourcing to cut project costs by 10%. Who's that, Gustave Eiffel? A resume for a civil engineer like that will knock Molly's M.C. Escher-patterned socks off. Managed design and construction of all major projects. Worked with cross-functional teams to deliver work on time and within budget. Tasked with identifying design flaws in ongoing projects. Worked with STADD Pro on client jobs. That's like a new AutoCAD document. It shows potential, but it doesn't actually deliver. Writing an entry-level civil engineering resume with no experience? Most civil engineering job descriptions overstate required experience. 1-2 years of experience often means an internship. 5 years can mean just one year. You can also list volunteer work, academic accomplishments, and transferable achievements. They'll all beef up an anemic civil engineer intern resume. Look at these two entry-level civil engineering resume examples. Civil Engineering Experience: None yet. Still looking for my first big job. That's about as effective as the St. Francis Dam. Consulted on a bridge for a volunteer project to connect a small town in Guatemala to a hospital and other basic services, helping 143 residents. Headed local playground design and project management for $60,000 project. Used AutoCAD to create 17 structural designs. Assisted in field work for construction job with $2 million budget. That's Bechtel-level. Yet you can probably write a civil engineering student resume like that right now. Pro Tip: Still worried you don't have enough experience for a great resume for civil engineering? A little underqualified is better than a little overqualified. Managers like to hire people who can grow into a role. Don't overload the hiring manager with boring language. Build your QA or QC civil engineering resume with action words instead. Of course a great civil engineer resume needs education. But did you know it matters how you show it? But the best applicants add achievements that secure the job like a Pratt Truss. The graduate civil engineering resume examples below show what I mean. Picture a job that values structural performance, AutoCAD skills, and a detail-oriented mindset. Which of these two sample civil site engineer resume education sections does it best? Scored top of the class in Structural Performance. Independent study project in AutoCAD was featured in The Constructor blog. Commended by professors 3x for detail-oriented mindset. Wow, that's in the Pillars of the Earth zone. It's built from details the hiring manager respects. That's like the dog-leg in the channel tunnel. It'll slow everybody down. You've got to show an area of interest in civil engineering, even back in school. Pro Tip: Don't put your civil engineering internship in your education section. Add it to your work experience—it counts. Let's look in again on our hiring manager, Molly. What's the #1 thing that'll make her hire you? It's knowing you've got the skills she needs. But you can't just list them all in your civil engineer resume and hope she believes you. You need to focus on the few shown in the job ad. Then prove them in your bullet points. Check out two civil site engineer resume examples. In both cases, the job ad wants forensic engineering skills, collaboration, and a detail-oriented mindset. You may as well say, "Sure I'm qualified." Conducted 10 forensic investigations into damaged commercial buildings. Worked with independent adjusters to fix insurance payments 15% above average. That's as solid as the Great Wall of China. Need key skills for a civil engineer resume? Use the list below. Here's a list of civil engg resume keywords to start. Add to it from civil engineering job descriptions online. Follow the steps above, and you'll write a mid-level or civil engineering intern resume worthy of Isambard Brunel. Pro Tip: Been shopping your best civil engineering resume around too long? Consider taking a job you don't love for a few months, just to get experience. Entry-level civil engineer salaries are the doorway to your dream job. If you're not certified, your career is as sturdy as the Titanic. But even if you've got your PE, you need to show it right on your civil engineering resume. Next, put it in your resume summary. See the civil engineer resume template up top for placement. Notice we separated the PE license from the certifications. We don't want to confuse a two week cert with an eight year license. Pro Tip: Don't give up. Some new grads submit 300+ civil engineering resumes before they get a job. Sound daunting? Recruiting sites like ZipRecruiter offer one-click application. What certifications should you leave off a resume for a civil engineer? See our dedicated guide: How to Include Certifications on a Resume? Remember our hiring manager, Molly? She won't hire based on civil engineering experience and education alone. Molly wants to hire a great employee. How can you convince her with your civil engineer resume? By using dedicated "other" sections. The goal? To show you're Doc Brown with better organizational skills. The next two mid-level civil engineering resume examples show how. Well, we all need ways to pass the time, but those don't show a switched-on civil engineer. But what about this exceptional civil engineer resume example? That applicant might design the next Palm Islands or Carlsbad Desalination Plant. But with a little elbow grease, you can write your own civil engineer resume like that. Pro Tip: Definitely join a pro association like the ASCE, NSPE, or both. They look particularly good on entry-level civil engineering resumes. Plus, the networking alone can get you interviews and jobs. How About a Civil Engineering Cover Letter? Hey, nobody reads cover letters, right? So you don't need a cover letter for your civil engineering resume. Nobody reads generic cover letters. Ones that read like blueprints for a post barn. So, make your engineer cover letter personal. Use the hiring manager's name if you can find it. Then, offer proof you'll do it right. End your cover letter with an offer. Try something like, "I'd welcome the opportunity to explain how I found three design flaws before they caused catastrophic structure failures." Pro Tip: PS— adding a "PS" to your cover letter is a great way to get it read. Put an eye-opening achievement or other fact in it. A "PS" holds the eye like a hanger reinforcement bar. You nailed your civil engineering resume, but botched the contact info. Now your dream job is galloping away like the Tacoma Narrows Bridge. But also, consider adding two other pieces of important resume contact info. A profile website can attract more interviews. Stuff it with projects, CAD designs, dissertations, and other accomplishments. Plus, 87% of recruiters use LinkedIn during job searches. A LinkedIn profile will definitely boost your hireability. Pro Tip: An effective LinkedIn profile needs strategic photos. It also needs the right civil engineer resume keywords. Learn the steps in our guide to LinkedIn mastery. Start with the job offer. Highlight what it's asking for. You'll need that as a blueprint for your great civil engineer resume. Pick your bullet points carefully. Almost every item in a resume for civil engineering should show a desired skill in use. Add metrics to show mastery. Put "other" sections in a civil site engineer resume to prove you're more than just a piece of paper. Add an ASCE membership, volunteer work, and publications. Do you have questions on how to write a great resume for a civil engineering? Not sure how to describe your skills or achievements? Give us a shout in the comments! We'd be happy to reply!